Hibernation lasts between 5 and 8 months. During hibernation, their metabolic processes, breathing and heart rate will slow down and they will survive solely on their fat reserves. During hibernation, grizzly can wake up at any time. The grizzly bear (Ursus arctos ssp.) is a large subspecies of brown bear inhabiting North America. Mating season lasts from late spring to early summer, but females become pregnant when they enter hibernation. They give birth to 2 cubs few months before the hibernation ends. The grizzly gets its name from the silver tipped hairs that it gets as it grows older. These silver tipped hairs give them a grizzled appearance! Cubs will stay with their mother 2-4 years. She is very protective and if you come close to her cubs she can easily kill you. Most grizzly bears are found in western Canada and Alaska. They are also found in several northwestern United States, including Idaho, Montana, Washington, and Wyoming. Cubs can climb trees when they are young. After few years they will lose this ability because of their long claws. Bear's claw is long like human's finger. Grizzly bears are found many different habitats, from dense forests to subalpine meadows, open plains arctic tundra, and coastlines. They have perfect eyesight and excellent sense of smell. They will detect smell better than hound dog. The grizzly bear is, by nature, a long-living animal. The average lifespan for a male is estimated at 22 years, with that of a female being slightly longer at 26. The oldest wild inland grizzly was 34 years old in Alaska; the oldest coastal grizzly was 39. Captive grizzlies have lived as long as 44 years. Grizzly lives up to 30 years in the wild and up to 40 years in captivity. They will eat up to 25 fish per day when they are preparing for hibernation to gain as much fat reserves as possible (up to 3 pounds per day). Despite its “large” reputation, the grizzly bear is one of the smallest of the brown bear subspecies. Average total length in this subspecies is 198 cm (6.50 ft), with an average shoulder height of 102 cm (3.35 ft) and hindfoot length of 28 cm (11 in). A large coastal male may stand up to 3 meters (9.8 ft) tall on its hind legs and be up to 1.5 meters (4.9 ft) at the shoulder. Male grizzly is solitary animal (it prefers lonely life). They can be seen in large groups during migratory season of salmon. Bears will enter the shallow water and catch the fish when they jump out of the water. Most adult female grizzlies weigh from 130 to 180 kg (290–400 lb), while adult males weigh on average from 180 to 360 kg (400–790 lb). Although variable in color from blond to nearly black, grizzly bear fur is typically brown with darker legs and commonly white or blond tipped fur on the flank and back. Adults have massive, heavily built concave skulls, which are large in proportion to the body. Although grizzly bears are large animals, 75% of their diet is comprised of berries, leaves and nuts. They also like to eat fish, rodents and moose. Animals that eat plants and animals are called "omnivores". The grizzly bear has a large hump over the shoulder, which is a muscle mass used to power the forelimbs in digging; the hump is a good way to distinguish a grizzly bear from a black bear, as black bears do not have this hump. A grizzly bear’s front claws measure about 5-10 centimeters (2-4 inches) in length. The long claws are used to dig for roots and to dig up burrows of small mammals. Grizzly bears tend to be solitary animals, with the exception of females and their cubs; and in coastal areas, grizzlies gather around streams, lakes, rivers, and ponds during the salmon spawn. Grizzly has 3-4 feet in height when it is on all four legs. It can be up to 8 feet tall when it stands on back feet. Home ranges overlap extensively and there is no evidence of territorial defense. Grizzly bears communicate through sound, movement, and smell. They can express emotions through a series of different vocalizations such as grunts, moans, and growls. Grizzly bears have keen senses of hearing and smell, but poor eyesight. Grizzlies have better sense of smell than a hound dog. They can smell food 5 kilometers (3 miles) away. A grizzly bear’s jaw pressure is powerful enough to crush a human head. It has been estimated that a bite from a grizzly could even crush a bowling ball. Grizzly bear is huge animal. Most bears weigh between 300 and 800 pounds, but some captured animals weighed up to 1400 pounds. A grizzly bear can reach speeds of around 56 kilometer (35 miles) per hour. By comparison, Usain Bolt’s top speed is 44.72 km/h (27.8 mph). Grizzly bears use growls, roars and snorts to communicate with each other. They are good swimmers too. As cubs, they can climb trees, but as they grow larger that becomes less of an option. Grizzly bears are omnivores. Their diet changes with seasonal availability of different food sources. The most commonly eaten plants are the fleshy roots of some plants, fruits, berries, grasses, and forbs. 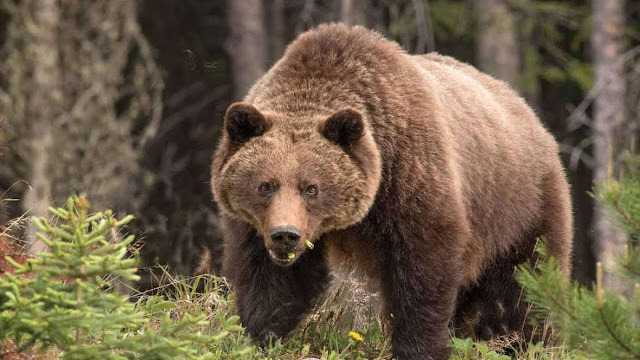 If grizzly bears are on the hunt, their prey can include fish (especially salmon), rodents like ground squirrels, carrion and large mammals, when available, such as moose, elk, reindeer, white-tailed deer, mule deer, bighorn sheep, muskox, and bison. In fall a grizzly bear may eat as much as 40 kilograms (90 pounds) of food each day, and it may weigh twice as much before hibernation as it will in spring. Grizzly bears hibernate for 5–7 months each year except where the climate is warm, as the California grizzly did not hibernate. You can recognize grizzly bears by the hump on their back. Hump is made of muscles. Grizzly bears hibernate throughout winter, preserving energy by reducing heart rate and body temperature by a few degrees. Hibernation takes place in a den, often dug into a sheltered slope, in which the bear may survive for over half a year without eating, drinking, urinating or defecating. Grizzly bears mate from May to July, and a gestation of 180 to 250 days follows, with births occurring from January to March, usually while the female is still in hibernation. Litter size is between one and four cubs, averaging twins or triplets. Cubs are born almost hairless, blind and helpless. While the mother continues to hibernate, her cubs will nurse. After six weeks the cubs’ eyes open. By spring they have fur and teeth, as well. Grizzly bear has brown fur, but hairs on the shoulders and back have white tops which give them "grizzled" look. That is why they are known as grizzly bears. Cubs gain weight rapidly during their time with the mother — their weight will have ballooned from 4.5 to 45 kg (10 to 99 lb) in the two years spent with the mother. Mothers may see their cubs in later years but both avoid each other. There are approximately 15,000 grizzly bears in Canada. The Alaskan population of 30,000 individuals is the highest population of any province/state in North America. Only about 1,500 grizzlies are left in the lower 48 states of the US. Grizzly bears can be dangerous to humans, particularly if surprised or if humans come between a mother and her cubs. Also you are more likely to be attacked by a grizzly bear if you scream out loud, fight back, or run away.